13-03-2015 Dmitry Epstein gave it 5stars! Subtitled “Fifty Years Of Stuff,” a marvelous overview of lost gem’s of English folk rock first decades on the stage and behind the scenes. She may be praised as a national treasure now, but only core followers were interested in what Judy Dyble‘s been doing in the time when her name didn’t grace the music press pages. And here’s a reward for the aficionados’ loyalty: compiled and issued by the singer herself, this 3CD-box offers a genuine continuity with a fantastic selection of Dyble’s album fare, rarities previously scattered across limited editions and collaborative efforts, and recordings that haven’t seen the light of the day before. More so, it reveals Judy as an intrepid experimentalist as well as traditionalist. Although ordered chronologically, the collection ends with a recentconcert take on “If I Had A Ribbon Bow” which the chanteuse entered a public eye with, when she fronted FAIRPORT CONVENTION, and their fans will be happy to hear a couple demos from 1967. One of these is the deeply emotional “One Sure Thing” that Dyble would revisit in a crunchier, almost punk setting with THE CONSPIRATORS in 2008, on a single housed on CD2, yet there are earlier tracks – two home recordings from 1964, “Come All Ye Fair And Tender Ladies” showing the 15-year-old artist not afraid to infuse an Appalachian tune with her own, English personality. Yet in 1966, in the company of Richard Thompson, she went much further, for a riveting folk-tinged improvisation, present on the first disc in a much abridged form than is on the source tape and throwing a bridge to Judy’s later sonic adventures like solo “Seventh Whorl” or “Noh Kro Poh” that she notched for JOXFIELD PROJECT. The ’70s saw Dyble disappear into family life, yet it didn’t deter her from singing, and Mike Batt was smitten with Judy voice, so one may only wonder why the richly orchestrated “Better Side Of Me” stopped in 1972 at a demo stage, as did the slide-adorned merry vocalizing on “I Hear A Song” from the following year. Still, there’s a gap between those and her psychedelic version of “See Emily Play” from 1982, when Dyle worked with Adrian Wagner, and then to 2004, when Judy returned to action to stay on. The comeback is reflected on “Going Home” from “Enchanted Garden” where the erstwhile folk sensibility gets married to a cosmic buzz of a soundscape before unwinding into an almost orchestral “Lost In Fingest” – and it was at this point that she opened up for epic compositions. The artist breathes transparent fire into “Shining” whose “I am lost for words” refrain lingers in one’s mind long after its rays dissolve in vibrant silence, although her longest suites – LP side-long “Harpsong” and “The Sisterhood Of Ruralists” – aren’t part of the box. Scope aside, it’s nigh on impossible to imagine gentle Judy in a metal mode, yet here she is, grafting a second voice to “Every Sentimental Moment” on a KINGS CROSS single in 2009, but the title piece on “Talking With Strangers” finds Dyble in her very element – piano-backed and soaring, while freezing her flight down to a faux-fairy tale of “Wintersong” off 2013’s "Flow And Change". High or low, though, Judy Dyble is so natural – an integral part of the nature – that she’s mesmerizing throughout. With threads gathered into a fine tapestry, this collection opens the doors to her second spring: she’s a treasure, indeed. Self-compiled, vault-raiding, three-CD comp from original Fairport Convention singer. North London-raised Dyble has often appeared a figure out of time and place in her under-appreciated yet quietly remarkable career. The sleevenotes accompanying this handsomely packaged collection recall former librarian JD sat on the stage edge knitting at scenester hangout The Speakeasy while fellow Fairporter and boyfriend Richard Thompson jammed onstage, with Jimi Hendrix. It is certainly Dyble’s singular character and unaffected, sure and steady purpose that runs through these tracks. The home recordings age 15, early Fairport demos, hook ups with pre-King Crimson Robert Fripp and post-Them Jackie McAuley are all of a piece with last year’s ravishing Take Me Dancing, the latter a product of her rewarding creative partnership with writer/producer Alistair Murphy. Despite a prolonged hiatus (child raising and running a cassette duplication business) Judy’s genre-hopping facility across folk, prog, jazz, orch pop and, even, rebel rock is a tribute to her path-less-travelled daring and resilience. Standouts include Better Side Of Me the only surviving gem from her 1971 sessions with Mike Batt and Shining, the classical-enhanced pastoral mystery and loveliness from post-comeback 2006 release Spindle. Off-piste and experimental gems abound, but the strongest and most compelling material is the most recently recorded (CD3: Onwards). Much of this work has been created away from the spotlight, but through it all Judy’s voice and vision has attained an evanescent lightness of touch and richly layered maturity. For those yet to make the lady’s acquaintance, discovery is advised and there’s no better place to start. Must-have retrospective from quietly pivotal folk/prog figure. 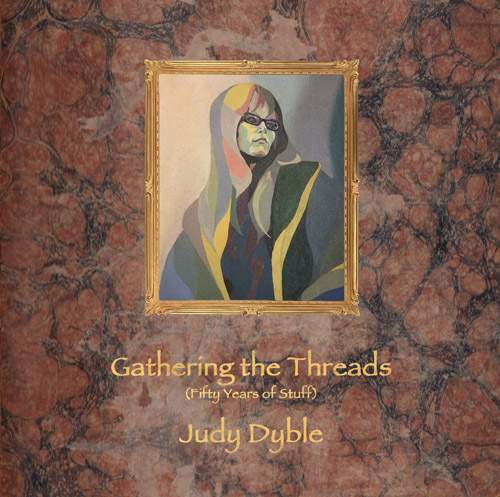 Through her stints in the formative line-ups of Fairport and King Crimson, the shy, reclusive, self-effacing Judy Dyble is part of the history of progressive music. Thankfully, she’s been more active of late, and now we have this wonderfully intimate three-disc treasure trove. Dyble’s clearly been digging through the crates to find the touchstones of her past, and has unearthed some real curate’s eggs here. Disc one, The Early Years (1964-1982), has home recordings, demos and ‘cassingles’. Taped with her Folkmen in Christmas ’64,Spanish Is A Lovin’ Tongue, Come All Ye Fair and Improvisation (with then-boyfriend Richard Thompson) are woolly in quality, but the style pours through the speakers as if from a world long gone. Fairport’s upbeat demo of Joni Mitchell’s Both Sides Now and brilliant One Sure Thing are glossier, while the four tracks from The Brondesbury Tapes with Giles, Giles And Fripp really are a cut above – the singer in now-exalted company and elevating Make It Today, a Fripp-heavy Under The Sky. The Return 2004-2009. On comeback album Enchanted Garden, then Spindle and The Whorl (both ’06), the voice is burnished by age, the tone concentrated into a truly vintage sip on Going Home, I Talk To The Wind (yes that one). More notable curios here too: unreleased demo the gentle In The Moment and odd world/ambient collaboration with the Joxfield Project (Noh Kro Poh). Disc three, Onwards (2010-2014), brings us up to speed with tunes from Talking With Strangers and Flow And Change, and work with everyone from Tim Bowness to Sleepyard. Judy’s own typically warm, informative and self-effacing sleevenotes only add to this package’s must-have quality. retrospective that also cannily looks forward. started it all, If I Had A Ribbon Bow. the vital music within. Truly magnificent.